The Trenton Thunder will wear these Pork Roll uniforms on Fridays during the 2018 season. One of the best parts about minor league sports are the bizarre, novelty uniforms teams will wear to get fans interested. SpongeBob basketball jerseys? Abraham Lincoln hockey sweaters? Just fantastic. The New York Yankees' Double-A affiliate, the Trenton Thunder, are the second to join in on the fun. The team announced Wednesday they'll be wearing uniforms inspired by New Jersey's most famous breakfast meat starting Friday, May 18, and on every Friday for the rest of the season. "Pork Roll is a New Jersey staple that can be served on everything from breakfast sandwiches to burgers and we're thrilled to celebrate it on a daily basis at ARM & HAMMER Park," said Thunder GM/COO Jeff Hurley. "Re-branding ourselves as the Trenton Pork Roll on Friday nights is the perfect way to celebrate a Garden State favorite!" Friday, May 18 will feature a special Pork Roll Apron giveaway to the first 1,025 fans, ages 21 and older, when the Thunder host the Bowie Baysox (Baltimore Orioles). The night will be a Pork Roll Celebration, presented by Case's Pork Roll, with special $1 Pork Roll sandwiches available throughout the game. 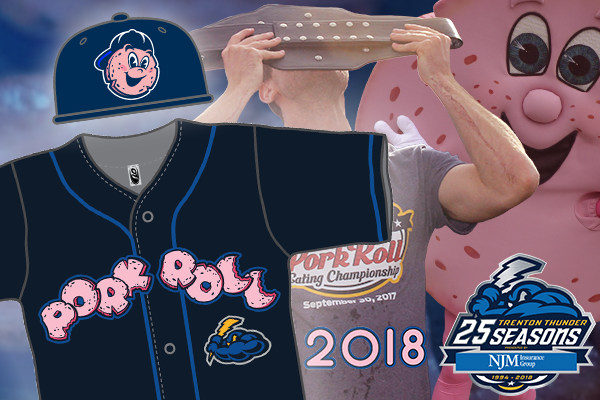 Unique Pork Roll themed merchandise will also be made available online and in-person at the Thunder Company Store later in the spring. The question now is when will a local minor league team change its name to the Scrapple for at least a game or a portion of the season? The IronPigs, given their name and track record, are the obvious favorites. But looking at this map of MLB-affiliated teams, the Reading Fightin Phils or Wilmington Blue Rocks also could pounce on the next obvious step in breakfast meat uniforms.